So. I’ve been making pot roast in a slow cooker for ages. The recipe is simple, reliable and delicious. I didn’t think anything could ever replace that recipe. And then, this week, I tried making pot roast in my Instant Pot, using the pressure cooker settings. 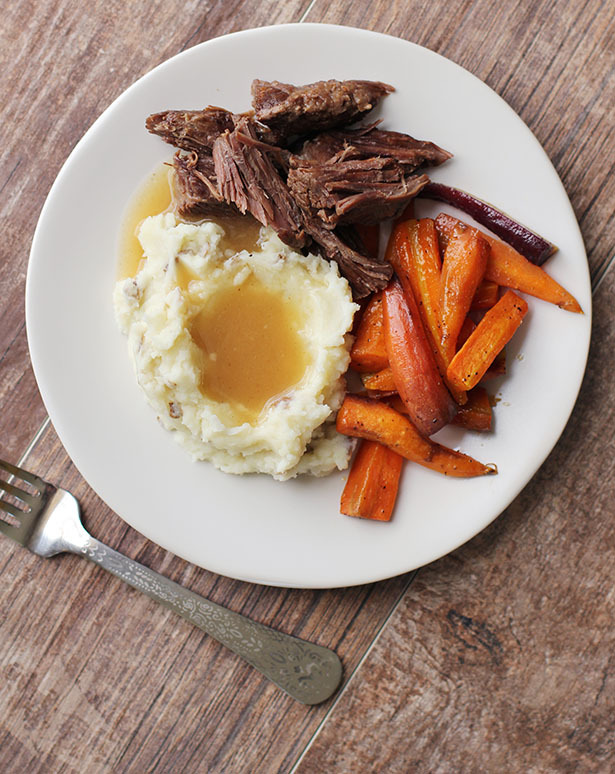 Whoah, boy, pressure cooker pot roast just replaced slow cooker pot roast. Quite frankly I’m stunned by this upset. But I’m happy about it just the same. I bought an Instant Pot I think three years ago and, until last month, had used it only once. I tried cooking basic chicken using the pressure cooker function and it worked, well, fine. It didn’t blow me out of the water, and so the Instant Pot got pushed to the back of the cabinet. And then my friend Christine mentioned a few weeks ago how she loves making brown rice in the pressure cooker. So I dug it out and started experimenting. As of today I am so-so on brown rice (I just haven’t perfected that process yet) and in love with making beans in the pressure cooker (I’ll share that recipe another day, it took some tweaking but I finally have it where I like it). And then I decided to try pot roast. HUGE SUCCESS. It tasted the same as my slow cooker pot roast and, top to bottom, took about 2 hours instead of the usual 8-9 hours. 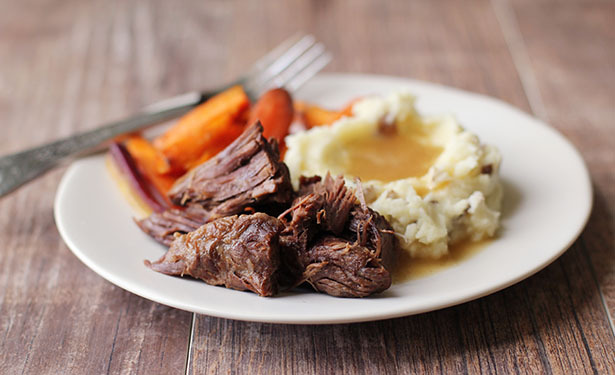 I will say this – I can totally see instances where cooking the pot roast for 8 hours will be more convenient based on my schedule for a particular day. But what is so glorious is now I have two options, 2 hours or 8 hours, with equally delicious results. 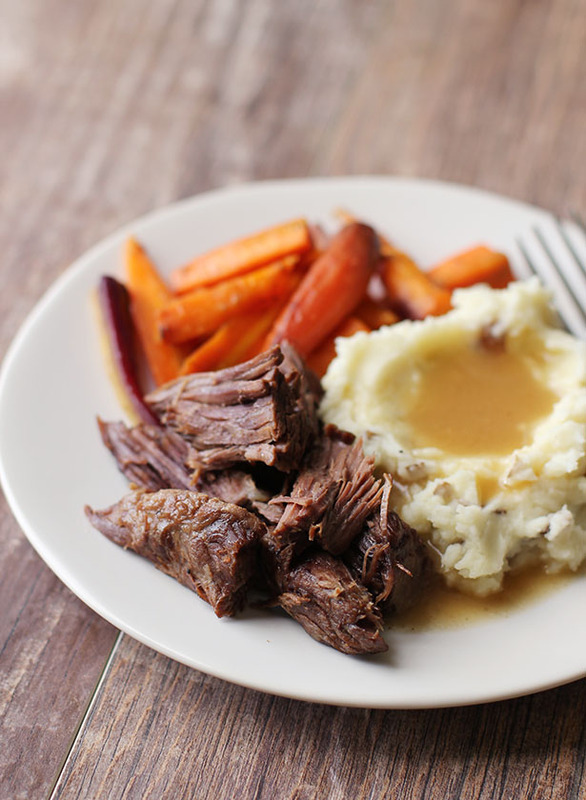 Hooray for pressure cooker pot roast! Simple, easy and delicious! Instructions below are based on using an Instant Pot. Sprinkle roast evenly with salt and pepper. Set aside. Select the "Browning" setting on the Instant Pot. Add oil to Instant Pot and let heat up. Once hot, brown the roast on both sides, a few minutes per side until you start to get beautiful browned spots. Set roast aside. Add onions to the Instant Pot and cook until softened and translucent. Stir regularly. Add broth to Instant Pot, scraping the bottom of the pot to deglaze. Let onions simmer in the broth about 3 minutes or so. Add roast and change Instant Pot setting to High pressure. Make sure the pressure release handle is on "Sealing." Set the timer for 90 minutes. It will take about 15 minutes for the pot to build pressure and for the 90-minute countdown to begin. When the 90 minutes is over, turn off the pressure cooker and let it sit for 15 minutes, letting pressure release naturally. At the 15-minute mark, using a hot pad and being careful not to touch the steam, turn the pressure release handle to "Venting" to release the rest of the pressure. Once it stops steaming, remove the lid. Let roast rest for 10-15 minutes. Use juices for gravy, straining the juice first to remove the "stuff" left behind in the juices. Make gravy using white roux (click here for recipe and instructions). You can also use a slurry made from ½ cup flour whisked with 1 cup cold water to thicken the gravy if you forgot to make the roux. yay! that makes me so happy to hear! Thank you for following up with your results!